Visited this Greene King establishment yesterday and pleased to say it was a pleasant stay. If is a sports oriented boozer which is right up my street so I was happy. It is very much a locals local but that said it didn't feel cliquey like some previous reviews have said. The majority of the crowd were males in their twenties who seemed like they were there for a couple of liveners before heading off the the more fashionable bars and clubs of Reading Town centre. This would've been me around 12 years ago before I was attached to a ball and chain (sorry I meant the wife) Atmosphere was convivial though. They do serve ales however, being a Greene King the choice is fairly limited and uninspiring so went for a Punk IPA. Not the cheapest pub unfortunately but all in all I would definitely return if I am ever in the area again. Can't understand the last comment. I visited yesterday and found both the landlord and landlady to be extremely friendly and helpful as were all the locals. Yes, the TV was turned up rather louder than I prefer but then there was a crowd watching the racing. London Pride, Courage (Wells) Directors and Green King Abbot on offer. The Pride at £3.20 was in good nick. I thought that the refurb was quite well done. I'd certainly use this lace if I was a local. This pub has had a refurb, beer is more expensive, although the beer used to be fairly reasonable so it's now up to the average price for this area. 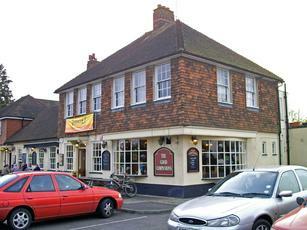 A more comfortable pub and a little bit more food oriented. First indications show that the Chav count is reduced. It's a John Barras pub, had 2 real ales available, London Pride & Black Sheep Bitter, beer was fairly well kept.